I am directed to forward her with copies of SFIO's Letters dated 1 November, 2017 and 22" December, 2017 on the above subject with the request that the said letters may kindly be given wide publicity in all the offices under your administrative control. Applications of eligible officers may kindly be forwarded to this office within stipulated time limit. 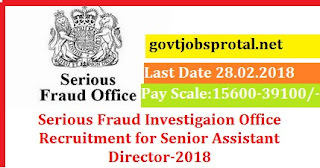 Applications from eligible officers in the prescribed proforma (in duplicate) may be forwarded through proper channel to the Director, Serious Fraud Investigation Office, 2" floor, Pt. Deendayal Antyodaya Bhawan, CGO Complex, Lodhi Road, New Delhi within 60 days from the date of publication of this advertisement in the Employment News along with photocopies of upto date ACRS/APARs for the last 5 years, duly attested (on each page) by an officer of the level of Under Secretary or above, Vigilance Clearance Certificate, Integrity Certificate and the Certificate of major/minor penalty imposed on the officer during the last 10 years of his service. The Cadre Controlling Authority may also kindly certify to the effect that the particulars furnished by the officer have been verified and found correct. a). Applications received after the due date or without ACRS/APARs or otherwise found incomplete or not received through proper channel will not be considered. vacancies may be given wide publicity in all the offices under their control. (You will get more information in employment News paper dated on 30/12/.2017 Page no.(21).) Visit the official website for more information.